The war in eastern Ukraine has been going on for more than two years. It’s often described as a low intensity war and formally there is a cease fire between the Ukrainian Army and the prorussian separatists. But as soon as the international peace observers leave the battle zone for the day, hell breaks loose again. 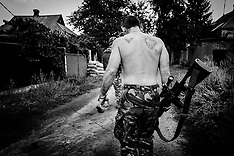 The Donbas battalion is holding the front in the small town Maryinka where more than half the population has left.